Being healthy can take its toll on your joints. You need to exercise everyday to stay healthy into your golden years but not everybody can go swimming everyday. If you could, your joints wouldn’t experience so much wear and tear. Many people resort to running and lifting weights. These two forms of exercise can put a lot of pressure on your joints. If you’ve already been running for several years, you likely know this already. Are you having trouble getting up or down the stairs? Has walking become challenging (never mind running)? The joints in your knees are a common place to feel discomfort from running over the years. If you’re a weightlifter, you might be feeling it in your shoulders too. It’s time to go back to the days when you were fit and not in discomfort. 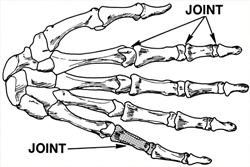 You can begin to support your joints before you lose that life. A natural joint supplement is the way to go. You won’t be adding any unwanted chemicals into your body. FLEXSolve 24/7 focuses not only on your joints but also on your connective tissue. In addition to supporting the tissue that connects your joints, it also supports healthy joints starting at the core. It first goes to work on the inside of your joints and works its way to the outside. It can help you feel less discomfort. It can also protect you from feeling discomfort in the first place as you continue to age. In addition to protecting and maintaining joint health, it also promotes flexibility, mobility, and strength. A healthy joint will be able to support a lot more weight (strength) and will have the potential to boost your mobility and flexibility as well. So not only will you be protecting against discomfort, you’ll actually be improving your functional abilities. Who wouldn’t want to show off their flexibility and strength? Exercise is mostly for you, but you do get the perk of impressing others too. Don’t cut down your exercise routine out of fear that you won’t be able to kick a ball around when you get older. Instead, give your joints an added boost with a natural joint supplement. Made from bark extracts, root extracts, leaf extracts, seed extracts, herbs, and other natural ingredients, you won’t be putting anything into your body that your body won’t know what to do with. It’s natural. You can also check out our blog for ten low-impact exercises that are easy on your joints. With the right kind of exercise and the right nutritional supplement, you can help ease joint discomfort. Don’t wait for your discomfort to come or get worse. Be proactive. Support yourself with a supplement that can give you your healthy life back – or help you hold onto it as you get older. Order FLEXSolve 24/7 today to start on your new path of joint health – your body, both today and down the road, will thank you.